England Saxons captain Jordan Crane has backed the latest crop of Churchill Cup winners to go on and make a significant impression on the Test match stage. 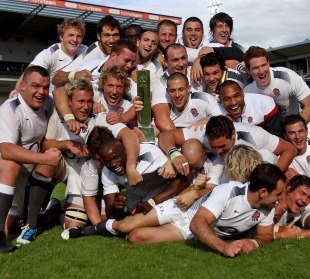 The Saxons fielded their youngest ever side in the ninth and final tournament - with an average age of 23 - in beating the USA 87-8 and Tonga 41-14 before defeating Canada 37-6 in yesterday's Sixways final. To underline the point, the Saxons try-scorers were Miles Benjamin , 23, James Gaskell, 21, Charlie Sharples, 21, and Jamie Gibson, 20. The game was controlled by fly half Rory Clegg, 21, who also supplied the conversions and a pair of penalties. Leicester No.8 Crane, who stepped up to lead the side in the absence of the injured Luke Narraway, paid tribute to the group that tightened up their tactics to pull away from a spirited Canada side after being held to a 15-6 lead at the interval. "It's been great and a credit to the guys and the management in the way we've come together," said Crane. "The way we've played and the way we've won our games has been really encouraging. It's been a pleasure to extend my season by three weeks and be part of it. "As long as everyone backs up their performances in the Churchill Cup with good starts to the Aviva Premiership and the Heineken Cup they'll be fine and there are some boys who've got a great future as England players ahead of them who've played for the Saxons in this tournament. "Canada were tough to break down, brought massive physicality and really frustrated us at times. It was our toughest game of the competition and it should be as a final, and we answered all the questions and came away with a good scoreline in the end." It was the perfect conclusion to the campaign for Worcester Warriors wing Benjamin, who scored a try in each half to go with his hat-trick against the USA and promotion back into the top flight with his club. "It's been a really nice way to end the season," said Benjamin. "From a club point of view it's been quite a stressful time in terms of thinking about getting promoted. Just to be involved in the Saxons was a nice way to finish the season and to win was the icing on the cake. "Canada were tough, they had a lot of enthusiasm and they've been together as a squad for a long time. They put us under a lot of pressure but fortunately we were able to supply pressure of our own and get a few tries to put ourselves in the clear. It was a bit of an error-strewn game, one of those in which both sides wanted to play and at times both teams needed to be a bit more direct. We're a young squad and it's a challenge to come in and perform but I think we did and in all they were three pretty resounding wins." His team-mate Graham Kitchener, 21, signed off as a Worcester player at Sixways and will join Leicester Tigers next month. "We've seen in this tournament that there are a lot of good young players coming through, playing well and making the team successful," he said. "It's a big step up to the seniors from there but I'm sure in a few years the boys will be making it and creating the core of the England team in a few years time. "I played age-group with the likes of Ben Youngs and Courtney Lawes, and likes of me and all the others see them and see it's not an impossible task to break into the senior team. Ultimately that is the goal."